Wow! That’s what I say when I visit many people’s aquariums and fish-houses, but this one really took the biscuit. In the whole time I have spent in aquatics, I have never seen a privately owned aquarium on this scale, and actually wonder if it may be the largest privately owned freshwater aquarium in Britain. Before the visit, the editor gave me the brief. We are normally quite busy putting the magazine together and all I caught was “big tank”, “Pacu” and “Wharf”. I thought I heard her say that it was 600 gal. situated upstairs, and that the owner also had a large fish-only marine tank. Needless to say, I got most of it wrong, which made it even more awe-inspiring when I saw it for myself. But now I have other ideas. Now that’s what I call big! During my time spent in aquatic shops, I’d always joke with big-fish customers about their next tank: a popular joke would be to seal the living room and fill that with fish – but for most us it was a ridiculous pipe dream. 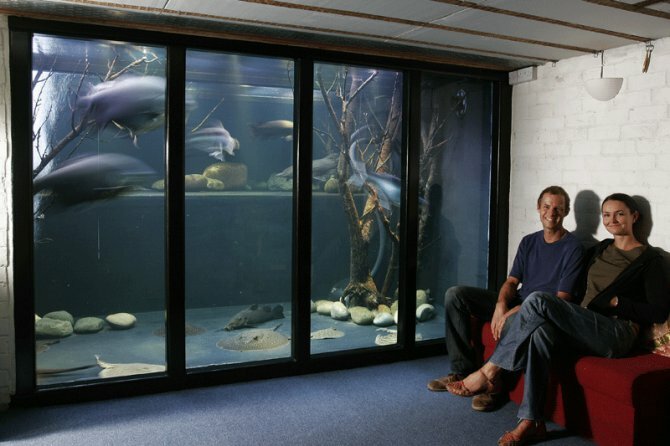 On the way downstairs to the cellar, you are greeted by a huge lungfish in a 210 x 73 x 71cm/7’ x 29” x 28” tank – he lives on his own and goes by the name of ‘Lungy’. He is an African lungfish, Protopterus annectens, and is over 60cm/24” long and as thick as your leg. I love lungfish so found Lungy to be a great spectacle in its own right, but there was more to come. Then you enter the cellar, and it hits you. You look to the left, and instead of a brick wall, you face this sheer wall of glass and behind it, some of the largest fish that I have ever seen in captivity, all looking very happy to be living in such spacious accommodation, and all thriving. This tank – if you can call it that – stretches from wall to wall, floor to ceiling, giving a widescreen cinema effect to the whole room. Standing or sitting on the sofa in front of the tank, the whole experience is quite awesome. I was speechless. Once my mind accepted the image before me, I was able to concentrate on its inhabitants and immediately noticed two Pacu – but not your bog-standard Pacu. No, these are two of the most active, rotund Pacu that I have ever seen, and a good size too at over 60cm/24” each. Looking closer and I could see that Jack also has a fair collection of stingrays dotting the black, fibreglass floor of the tank. The black accentuates their colours, and my mind did another reality check that they were sitting there in over 2.1m/7’ of water depth, and some of them are really b-i-g. Several are easily the size of dustbin lids, and they are thick; about 15cm/6” or more when viewed from behind. OK, let’s get down to the nitty-gritty: this tank. I keep calling it a tank, but I suppose it is more of a sunken tropical pond with viewing window, indoors. Under a house. Here goes. It is 381 x 388 x 213cm/12’6” x 12’8” x 7’ deep and is of the same size and footprint as his living room which is immediately above it. In fact, when sitting in the living room, looking between the floorboards you can see light escaping from the tank below. And how’s this for wild? The only access to the water is via a large section of floor that has been removed from underneath the bay window. Any potential burglar would have a fright if he crawled through that window one night. Just imagine, he would fall straight into the water and if he managed to avoid stepping on a stingray, he would then come face to face with two 120cm/48” long Alligator gars! The tank holds 18,160 l./ 4000 gal. and is an L-shape from front to back, meaning that the space immediately behind the viewing window is 7’ deep; the rest of the floor space is subdivided by a ledge that used to be the foundation for the bay window. And get this: three of the walls of the tank are, in fact, the foundation walls of the house. Needless to say, Jack had to do some pretty accurate calculations, especially when you consider the 18 metric tonnes of water behind the glass. The filter is home-made too, and is a 240 x 120 x 90cm/8’ x 4’ x 3’ box that Jack attached to the outside of the house and insulated to protect from the weather. It is full of Alfagrog biological media and floss, and is run by two OASE Profimax 30,000 pumps giving a turnover of 60,000 lph. The tank is heated to a temperature of 27ºC/80°F by a 6kW Koi heater. One advantage of building a tank underground, says Jack, is that all outward pressure on the walls is supported by the ground behind it, so in theory the walls can’t be pushed outwards. Water pressure on the glass is two tonnes per m2 at the bottom of the panes. He tested the glass before fixing it in place by putting weights on top of it on the floor. And now that it is filled, he checks for signs of bowing by aligning a straight metre stick against the panes. For volume, this tank is a bargain. Jack paid just £700 for the glass panels and £800 for the fibreglass. The glass panels come from Design A Glass. Decoration is simple and made up of large, smooth boulders. Normal bogwood would be swallowed up in such surroundings, so Jack has simply chopped a Damson tree in half and used that instead. Despite the heavy bioload, the advantage of the smooth fibreglass and large solids-handling pond pumps is that the water is very clear with no detritus. As for lighting, he switches between several fluorescents, spots and moonlight effects to both suit the mood and save on electricity. Besides, the fish don’t like it bright either. To clean the tank, Jack has to get inside it – and I think he secretly enjoys it. He was kind enough to demonstrate this and went for a swim at the same time! I cringed when he nearly trod on a stringray in light of recent events, but I have never seen anything like it before. To keep himself under the water, he uses a weight belt and by holding his breath he can clean the inner glass. Each water change sees him removing around 9000 l./2000 gal., and even with a high pressure hose, it takes six hours to re-fill. Jack has been keeping fish for 27 years – it all started after a visit as a kid to the aquarium in Blackpool. He kept a Red-tailed black shark originally in a community tank followed by some sticklebacks in a pond. At age 10, his dad found a 120cm/48” tank that Jack had to fix new stress bars to. He set it up as a community tropical tank but wanted marines too, so his parents bought him another tank. It wasn’t long before his tastes drew him to something larger, and when they moved house, his dad said that he could have the 60cm/24” space along the side of the garage to put more tanks. Jack, being Jack, filled the 335cm/11’ long garage with a 335 x 60 x 60cm/11’ x 2’ x 2’ tank and stocked it with Oscars, Giant gourami, Silver arowana and Ocellated garfish. He then found extra space underneath that tank for a 93 x 73 x 55cm/37” x 29” x 22” marine tank for butterflyfish and angels. Filtration was simply undergravel. In his next house, he built an indoor tropical pond that he eventually stocked with 12 stingrays. When it came time to sell that house, two estate agents felt that the pond would hinder sales, but a third said it might actually help to sell the house They took a risk, using the pond as a key feature – and the property sold. And now his cellar is a tank. As for the stingrays, well, they stayed in the previous house until Jack had built the new tank in his new home. Once they were settled, he introduced the Pacu and then a Pangasius hypophthalmus that he and girlfriend Billie actually rehomed from a public aquarium – such is the size of their tank! Apart from the Pangasius, all the fish are from Wharf Aquatics in Nottinghamshire. And such is the size of his collection that Jack can’t actually take anything that is under 60cm/24” long – not that many people can say that the smallest fish in their collection are a Giant gourami and a Giraffe catfish. Due to the size of this aquarium, Jack is able to house some species of fish that we would not normally recommend for life in captivity, and I must say that I take a certain amount of pleasure in seeing big fish in suitably large surroundings. The tank contains Pacu, Pangasius, a Red tail hybrid catfish, a Giraffe cat, Giant gourami, Alligator gars, a Spiny eel, stingrays and two Fly River turtles – totally aquatic turtles that look more like marine turtles with flippers instead of having webbed feet like terrapins. Again, the Fly River turtles have a large adult size, but they are living in an environment that could contain them for their entire lives. The stingrays have bred – Jack pointed out a gravid female on our visit, complete with a lop-sided bulge on her back that he said was a baby. He also showed us a new-born ray that he had rescued, being kept in a holding tank away from the gars who had already eaten several other newborns. Jack says that if he ever moves again, he will probably drain the tank and sell it as a wet room. He says that he would build underground again because of the advantages with outward pressure. "I would like to build a pool, 15 x 5 x 3m/50’ x 16’ x 10’ deep, to house big fish and grow them on," he said. "I would like to create the pool and then build over the top of it!" At 225,000 l./50,000 gal., if it ever comes to fruition, I will be the first in line to visit! If Jack ever does go bigger, he says that he would then move his marines into a tank with the volume of his current big freshwater tank, which I’m sure would be a spectacle. Not many people have the guts, vision or knowledge to create a tank like this. And Jack certainly knows how to keep his tankbusters happy! Never buy a fish which has a large potential size with the intention of buying it a bigger tank "as it grows". In most cases this just doesn’t happen as setting up a big tank can be an expensive business and other purchases/expenses tend to get in the way. Few public aquariums will accept fish that have outgrown their tanks – and many of these fish have long lifespans. If you can’t house it properly at the outset, don’t buy it. This is an article from the Practical Fishkeeping website archives. It may not be reproduced without written permission.